Fall brings with it cooler air temperatures. Your greenhouse should have been prepared for this, and hopefully you are ready to bring all of your plants back into the greenhouse for winter storage. As a guideline, you should prune your plants back about one-third for over-wintering. Before bringing any plants into your greenhouse, always check them for pests and make sure all pests are removed. To do this, leave your garden hose on the plant for a good five minutes to rinse out any pests. Cut the plant back one third, then spray the plant itself with a pest spray. Place a plastic garbage bag over the plant for about 24 hours. This should kill off any remaining pests. It is a good idea to repot the plant into fresh potting mix soil, so that the plant will have nutrients while being over-wintered. Plan on keeping your plants at a minimum temperature of about 45 degrees F. Always check for the minimum/maximum temperature that your plants can be subjected to. Your plants will dictate the temperature that your greenhouse needs to be kept at. 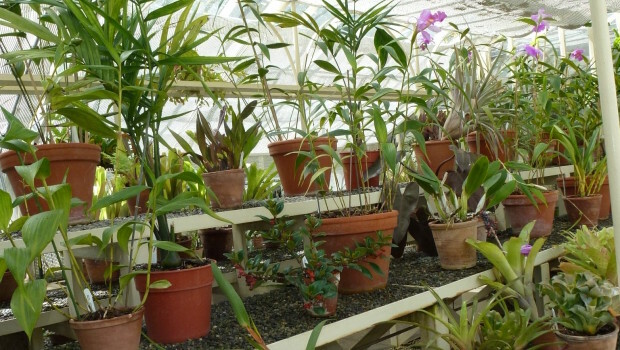 Tropical plants may need to be kept at a slightly higher temperature. In addition to plants, you can also store flower bulbs. This is easily done by cleaning them, making sure they are dry and placing them on a screened tray to ensure they get proper air ventilation. Water lily bulbs can also be stored the same way. However, they are best stored in a zip-lock bag that is filled half-way with a moist sand. These also require a temperature of about 55 degrees F.
Be sure all of your winter tools are washed and ready to go.